I really am quite a fan of a floral pattern. I read an article recently by House & Garden which said that Chintz is making a comeback and I’m pretty happy with that. I don’t have a huge amount of floral pattern in my home, and what I do have is fairly abstract and Husband-friendly! These three patterns make an appearance in my Living Room – to be discussed soon – and are pretty much the only nature inspired prints to make an appearance in the entire house – I’ve stayed fairly geometric elsewhere. In my opinion, whether it’s a modern or more traditional style, there are really only two types of floral pattern – abstract/impressionist or botanical/realistic. Chintz fabric can be found in either option, but is usually more abstract in design. So, I hope you enjoy this; a round-up of my favourite bits and pieces for fab florals for every home! Chintz at it’s finest! This sofa is upholstered in Sanderson Midsummer Rose DCAVMI201 and is one of my all time favourite florals. It’s an adaptation of a 1920s-30s block print on a cotton viscose mix base cloth. I know it seems pretty traditional initially, but I would actually love it in a modern living/kitchen space – oak floors, pale grey walls, white kitchen, this sofa. Or in a cosy reading room with vibrant magenta walls. Yum. Abstract in a different way – going retro! Scion Noukku collection, and curtain fabric of the same name, 120588, simplifies the flower form into a repetitive geometric shape, as is often done in Mid Century inspired pattern. This collection has a definite modern-Scandinavian feel to it and I like it a lot. Now I’ve found it, the knowledge that I will probably never own this rug is making me quite sad. It is beautiful, made by Ted Baker and called Maximil. I love the styling in this picture from their website too; makes it look so cool and effortless to add a dramatic floral into otherwise quite an industrial, masculine looking setting. To the other end of the scale, and the more traditional part of me really likes these curtains, in Jane Churchill Caprice J603F-03, a gorgeous printed and embroidered linen mix. I love the combination of floral and striped patterns and because all the fabrics come from the same colour family, it gives a really relaxed feel and would be really easy to put together and accessorize. 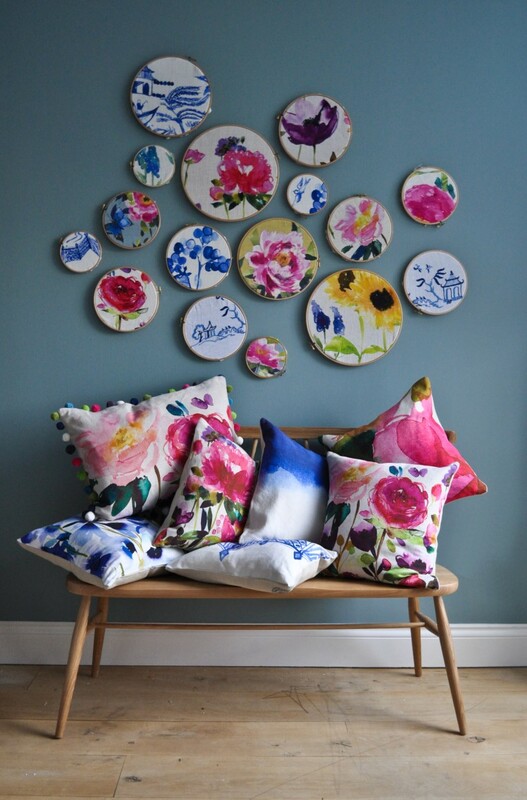 These floral treats are courtesy of Bluebellgray, one of my favourite homeware designers at the moment – and they sure know how to take an eye-catching pic or two! Ideal for the fickle floral fan – pick up some clashing cushions or bedding and swap them in/out as you fancy for an instant pick-me-up. This is the dining room of a Michigan Summer Home photographed by Werner Straube, for Houzz. Shows that there doesn’t have to be much of a floral, for it to make an impact on a room. Here, it’s just the 6 framed prints, and a tropical botanical print on the chair seat pads and it’s all it needs to look gorgeous! Obviously I am completely biased, based on the yellow and blue scheme, but I hope you agree?! You can usually pick up old botanical prints from charity shops or car boot sales so worth keeping your eyes peeled to make an interesting display. This is a lovely wallpaper by Nina Campbell called Benington, in NCW4103-01, left and -02, right. I think it would really lovely in a snug looking out over onto a garden, or in a wide, long hallway. It’s very easy-going and reminds me of hedgerows and country walks. Check out this Tulipa quilt from House of Hackney! It’s pretty pricey, so definitely somewhat of an investment(!) but it’s so pretty – velvet one side, and satin on the other! Luxurious and practical and an amazing use of colour for a full on modern botanical inspired pattern. A more informal take on the realistic style. 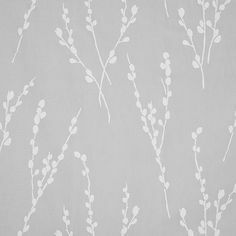 This is Designers Guild Saunier FDG2558/01, a modern fabric incorporating botanical foliage which looks as though it’s just been casually drawn on and coloured in! Whilst the composition of the pattern is quite abstract, the detail given to the flower heads and leaf structures definitely looks realistic to me! To finish, perhaps the most traditional botanical idea – and probably an obvious thought when you hear the word ‘botanical’ – Ferns! 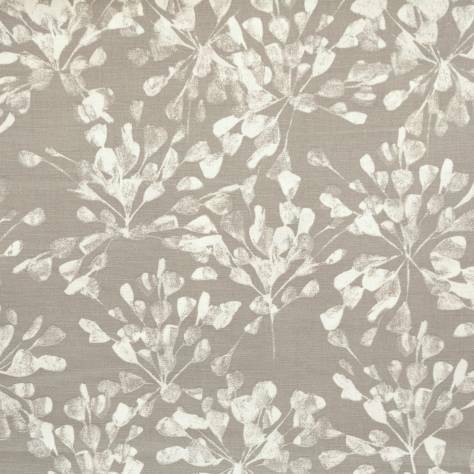 This Colefax and Fowler classic, Kendal F3217/01, would be such an easy pattern to use as curtains, blinds or upholstery. The variety of green shades makes it more livable than if it were all the same bright tone, and I think would make gorgeous bedroom curtains, teamed with pale yellow walls and classic cream painted furniture. This entry was posted in Inspiration and tagged abstract, Bluebellgray, botanical, chintz, Designers Guild, florals, House of Hackney, Houzz, impressionist, interior design, interior trends, interiors, Jane Churchill, Nina Campbell, pattern, realistic, Sanderson, Scion, Ted Baker. Bookmark the permalink.